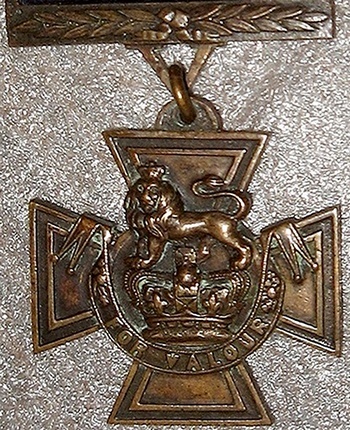 The Victoria Cross (VC), introduced on 29 January 1856 by Queen Victoria to honour acts of valour during the Crimean War, is the highest military decoration awarded for most conspicuous bravery, or some daring or pre-eminent act of valour or self-sacrifice, or extreme devotion to duty in the face of the enemy. Persons of any rank in the Naval, Military and Air Forces of the United Kingdom, its colonies or territories, and Commonwealth countries that award UK honours; members of the Merchant Navy; and civilians serving under the orders, directions or supervision of any of the above-mentioned forces or services are eligible for the award. The Victoria Cross (VC), that takes precedence over all other orders, decorations, and medals, is usually presented to the recipient or to their next of kin by the British monarch at an investiture held at Buckingham Palace. It was originally intended that the VCs would be cast from the cascabels of two cannon that were captured from the Russians at the siege of Sevastopol. However, x-ray studies of older Victoria Crosses revealed that the metal used for VCs are from antique Chinese guns and not of Russian origin. There is no evidence that the VC guns have ever been near Sebastopol. It does however seem that all VC's awarded have been cast from the same material. One of the Chinese cannons at the Royal Artillery Museum. 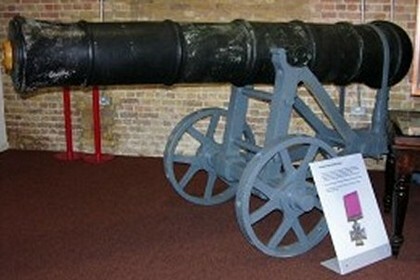 The barrels of the cannon in question are on display at Firepower - The Royal Artillery Museum at Woolwich. The remaining portion of the only remaining cascabel, weighing 358 oz (10 kg), is stored in a vault maintained by 15 Regiment Royal Logistic Corps at MoD Donnington. It can only be removed under armed guard. It is estimated that approximately 80 to 85 more VCs could be cast from this source. A single company of jewellers, Hancocks of London, has been responsible for the production of every VC awarded since its inception. The first ceremony was held on 26 June 1857 where Queen Victoria invested 62 of the 111 Crimean recipients in a ceremony in Hyde Park, London. Since then, the medal has been awarded 1,358 times to 1,355 individual recipients. World War one saw the introduction of the aircraft as a weapon of war and the young men that heroically flew the often rickety craft brought a new dimension to warfare. They put their lives on the line each time they took to the angry skies. Their lifespans were measured in mere weeks. They were heroes all. There were those however that went beyond the bounds of duty, whose valour in the face of the enemy and whilst in mortal danger spurned them to deeds unimaginable. They were the recipients of the Victoria Cross. Edward Corringham "Mick" Mannock & Nieuport Scout. Born in Ireland from Scottish parents Edward Corringham "Mick" Mannock (24 May 1887 - 26 July 1918) VC, DSO & Two Bars, MC & Bar was a British flying ace in the Royal Flying Corps and in the Royal Air Force during the First World War. Mannock served on the Western Front in three separate combat tours. Mannock's first aerial victory was the downing of a balloon, a hazardous feat at best. By the time Mannock had finished his first tour he had accumulated 15 victories. He returned to duty as Officer Commanding No. 85 Squadron in July 1918, and quickly added nine more victories to his tally. However, on 26 July Mannock, who had never lost a wingman and was regarded as one of the greatest fighter pilots of the war, inexplicably flew into the ground. He was killed in the subsequent explosion and was posthumously awarded the Victoria Cross. William George "Billy" Barker & Sopwith Snipe. Photo Canadian War Library. Canadian William George "Billy" Barker (3 November 1894 - 12 March 1930) VC, DSO & Bar, MC & Two Bars was his countries first Victoria Cross recipient and the most decorated serviceman in the history of Canada. Barker enlisted in December 1914 in the 1st Canadian Mounted Rifles and was send to England in June 1915 and then to France on September 22 of that year. In March 1916 he transferred as a probationary observer to 9 Squadron of the Royal Flying Corps, flying in Royal Aircraft Factory B.E.2 aircraft. On 7 July Barker was transferred to 15 Squadron and on the 21st July he claimed his first victory, a Roland scout. Having flown more than 900 combat hours in two and one half years with 33 aircraft and 9 observation balloons downed Barker was transferred back to the UK in September 1918 to command the fighter training school. In London at RAF HQ, he persuaded his superiors he needed to get up to date on the latest combat techniques in France and he was granted a 10-day roving commission in France, wherein he selected the Sopwith Snipe as his personal machine and attached himself to No. 201 Squadron RAF. While returning his Snipe to an aircraft depot, he crossed enemy lines at 21,000 feet and shot down a Rumpler two-seater. Barker was then bounced by a formation of Fokker D.VIIs and in the ensuing battle against 15 or more enemy machines, was wounded three times in the legs whilst his left elbow was blown away. Despite his horrific injuries he managed to not only keep control of the Snipe but shot down three of his attackers in a battle that raged over the Canadian lines. He eventually made a forced landing and was rescued from his badly damaged aircraft to months in hospital. He was awarded the Victoria Cross for his actions. Albert Ball & Royal Aircraft Factory SE5a. Photo Imperial War Museum. Albert Ball (14 August 1896 - 7 May 1917), VC, DSO & Two Bars and MC was an English fighter pilot during the First World War. At the time of his death he was the United Kingdom's leading flying ace, with 44 victories, and remained its fourth-highest scorer behind Edward Mannock, James McCudden and George McElroy. Ball joined the Sherwood Foresters at the outbreak of the First World War and was commissioned as a second lieutenant in October 1914. He transferred to the Royal Flying Corps (RFC) the following year and gained his pilot's wings on 26 January 1916. Joining No. 13 Squadron RFC in France, he flew reconnaissance missions before being posted in May to No. 11 Squadron, a fighter unit. On the evening of 7 May 1917, near Douai, 11 British aircraft from No. 56 Squadron led by Ball in an S.E.5 encountered German fighters. A running dogfight in deteriorating visibility resulted, and the aircraft became scattered. Ball was last seen by fellow pilots pursuing the red Albatros D.III of the Red Baron's younger brother, Lothar von Richthofen. Ball was observed flying into a dark thundercloud and he was then seen falling inverted from the bottom of the cloud, at an altitude of 200 feet (61 m), with a dead prop and trailing clouds of black smoke. Ball's Royal Aircraft Factory SE5a crashed and he was killed instantly. No bullet wounds were found on Ball's body. He was awarded the VC posthumously. Andrew Frederick Weatherby (Anthony) Beauchamp-Proctor & Sopwith Snipe. Photo commons.wikimedia.org. Andrew Frederick Weatherby (Anthony) Beauchamp-Proctor VC, DSO, MC & Bar, DFC (4 September 1894 - 21 June 1921) was a South African recipient of the Victoria Cross. 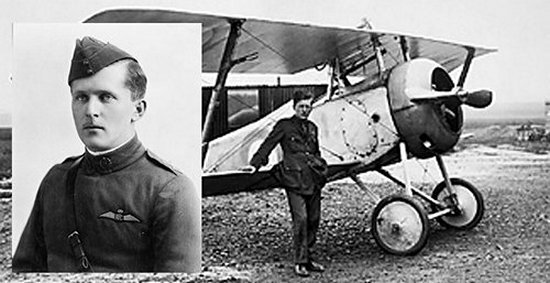 He was South Africa's leading ace of the First World War, being credited with 54 aerial victories. Proctor was studying at the University of Cape Town when the European war broke out. He took leave from his studies to join the Duke of Edinburgh's Own Rifles. In March he enlisted with the Royal Flying Corps (RFC) and on 10 June 1917, he soloed after just over five hours flying time. Beauchamp-Proctor's victory total was 54; two (and one shared) captured enemy aircraft, 13 (and three shared) balloons destroyed, 15 (and one shared) aircraft destroyed, and 15 (and one shared) aircraft 'out of control'. His 16 balloons downed made him the leading British Empire balloon buster. On 8 October, he was hit by ground fire and wounded in the arm, ending his front line service and in August 1915, he was demobilised with an honourable discharge. Beauchamp-Proctor was killed on 21 June 1921 in a training accident flying a Sopwith Snipe, in preparation for an air show at the RAF Hendon. His aircraft went into a vicious spin after performing a slow loop, and he was killed in the ensuing crash. Procter was awarded his VC on Victoria Cross on 30 November 1915. William Avery "Billy" Bishop & Nieuport 17. Photo commons.wikimedia.org. Air Marshal William Avery "Billy" Bishop VC, CB, DSO & Bar, MC, DFC, ED (8 February 1894 - 11 September 1956) was a Canadian flying ace and Victoria Cross recipient of the First World War. He was officially credited with 72 victories, making him the top Canadian ace of the war. During the Second World War, Bishop was instrumental in setting up and promoting the British Commonwealth Air Training Plan. In 1911 Billy Bishop entered the Royal Military College of Canada. When the First World War broke out later in 1914, Bishop left RMC and joined the Mississauga Horse cavalry regiment but became frustrated with the mud of the trenches and the lack of action. In 1915 he transferred to the Royal Flying Corps. As there were no spots available for pilots in the flight school, he chose to be an observer. However, in November 1916 he received his wings. On 17 March 1917, Bishop arrived at 60 Squadron at Filescamp Farm near Arras, where he flew the Nieuport 17 fighter. At that time, the average life expectancy of a new pilot in that sector was 11 days, and German aces were shooting down British aircraft 5 to 1. On 24 March he crash landed his aircraft during a practice. The next day Bishop claimed his first victory. His tally kept mounting and promotion came relatively quickly. Bishop's no-hold-barred style of flying always had him "at the front of the pack," leading his pilots into battle over hostile territory. Bishop soon realized that this could eventually see him shot down; after one patrol, a mechanic counted 210 bullet holes in his aircraft. He changed his tactics and in one month claimed 12 aircraft. By the end of the war, he had claimed some 72 air victories, including two balloons, 52 and two shared "destroyed" with 16 "out of control. He was awarded his VC on 11 August 1917. Lanoe George Hawker & Bristol Scout. Photo commons.wikimedia.org. Lanoe George Hawker VC, DSO (30 December 1890 - 23 November 1916) was a British flying ace, with seven credited victories. He was the first British flying ace and the third pilot to receive the Victoria Cross. Hawker learned to fly at his own expense at Hendon. On 4 March 1913, Hawker was awarded Aviator's Certificate No. 435 by the Royal Aero Club. He joined the Royal Flying Corps and was posted to France in October 1914, as a captain with No. 6 Squadron where he undertook numerous reconnaissance missions into 1915, being wounded once by ground fire. On 22 April he was awarded the Distinguished Service Order for attacking a German zeppelin shed at Gontrode by dropping hand grenades at low level (below 200 ft) from his B.E.2c. Following an initial air victory in June, on 25 July 1915 when on patrol over Passchendaele Hawker, flying Bristol Scout attacked three German aircraft in succession. He downed the first after he had emptied a complete drum of bullets from his aircraft's single Lewis machine gun into it. The second was driven to the ground damaged, and the third, an Albatros, which he attacked at a height of about 10,000 feet, burst into flames and crashed. For this feat he was awarded the Victoria Cross. Hawker was killed in a dogfight with the famous German flying ace Manfred von Richthofen ("The Red Baron") on 23 November 1916. Gilbert Stuart Martin Insall & Vickers FB6. Photo J M Bruce / commons.wikimedia.org. Group Captain Gilbert Stuart Martin Insall VC MC (14 May 1894 - 17 February 1972) was a recipient of the Victoria Cross. Insall was commissioned as a second lieutenant in the Royal Flying Corps on 14 March 1915. Insall was 21 years old and a second lieutenant in the 11 Squadron, Royal Flying Corps when he won the VC. On 7 November 1915 near Achiet-le-Grand, France, Second Lieutenant Insall, on patrol in Vickers F.B.5 Gunbus with 1st Class Air Mechanic T. H. Donald, engaged an Aviatik two-seater and forced the German pilot to make a rough landing in a ploughed field. Seeing the air crew scramble out and prepare to fire, Insall dove to 500 ft and his gunner opened fire, whereupon the Germans fled. After dropping an incendiary bomb on the downed German aircraft, Insall flew through heavy fire at 2000 ft over enemy trenches. The Vickers' petrol tank was hit, but Insall managed to fly the Gunbus back to Allied lines landing between trees only 500 yards from the German lines. Donald and Insall stayed by the Gunbus through a bombardment of about 150 shells while awaiting nightfall. After dark, they then set to work by torch light to salvage their plane. After they repaired the machine overnight, Insall flew them back to base at dawn. Insall could not personally receive his VC, however; he and Donald had fallen wounded into captivity on 14 December 1915. Alan Jerrard & Sopwith Camel. Photo commons.wikimedia.org. Flight Lieutenant Alan Jerrard VC (3 December 1897 - 14 May 1968) was an English pilot and the only Camel pilot to be awarded a VC. Jerrard was 20 years old and a lieutenant in No. 66 Squadron of the Royal Flying Corps when on 30 March 1918 near Mansu�, Italy Jerrard, with two other officers, on an offensive patrol, shot down one of five enemy aircraft. Jerrard then flying at 50 ft. attacked a German aerodrome where some 19 machines were either landing or attempting to take off. After destroying one of these he was attacked by more enemy aircraft but, seeing a brother-officer in difficulties, went to assist him, destroying a third enemy machine. Jerrard then continued his attacks on the aerodrome only retreating, with five machines in pursuit. He repeatedly turned to beat off the enemy until shot down by the ace Benno Fiala von Fernbrugg and he became a prisoner of war. After the war records revealed that the Camel's opponents were four Austrian Albatros D.III fighters, one of which was damaged and had to land, while another pilot was injured by a bullet. James Thomas Byford McCudden & Royal Aircraft Factory SE5a. Photo commons.wikimedia.org. James Thomas Byford McCudden VC, DSO & Bar, MC & Bar, MM (28 March 1895 - 9 July 1918) was an English flying ace of the First World War and among the most highly decorated airmen in British military history. Born in 1895 to a middle class family with military traditions, McCudden joined the Royal Engineers in 1910. Having an interest in mechanics he transferred to the Royal Flying Corps (RFC) in 1913 at which time he first came into regular contact with aircraft. 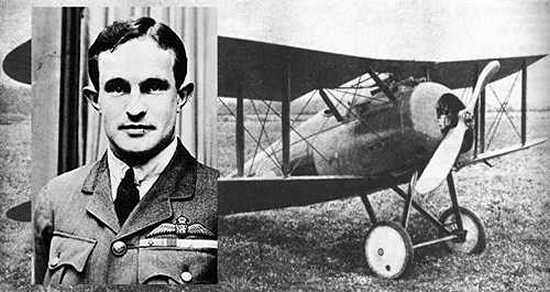 At the outbreak of war in 1914 he flew as an observer before training as a fighter pilot in 1916. McCudden claimed his first victory in September 1916. He claimed his fifth victory, making him an ace, on 15 February 1917. For the next six months he served as an instructor and flew defensive patrols over London. He returned to the frontline in summer 1917. McCudden returned to France on 21 January. The very same day he was forced down for the first and only time. He attacked an Albatros D.III and damaged its engine which stopped. Another Albatros attacked him and he was forced to break off from a certain kill when one of his propeller blades was partly shot off. Another DH.2 intervened and McCudden landed near Arras, ordered a new propeller, and flew back to base. That same year he dispatched a further 31 enemy aircraft while claiming multiple victories in one day on 11 occasions. At his death he had achieved 57 aerial victories, placing him seventh on the list of the war's most successful aces. Just under two-thirds of his victims can be identified by name. The majority of his successes were achieved with 56 Squadron RFC and all but five fell while flying the S.E.5a. On 9 July 1918 McCudden was killed in a flying accident when his aircraft crashed following an apparently aerobatic manoeuvre after take-off that went horribly wrong. His rank at the time of his death was major, a significant achievement for a man who had begun his career in the RFC as an air mechanic. Alan Arnett McLeod & Royal Aircraft Factory BE12. Photo commons.wikimedia.org. Alan Arnett McLeod VC (20 April 1899 - 6 November 1918) was a Canadian recipient of the Victoria Cross. He enrolled in the RFC at age 18 and trained as a pilot at Long Branch near Toronto where he soloed after only 3 hours flight time. He graduated with 50 hours of flying experience. On 20 August 1917 he was shipped overseas to France as an 18-year-old Second Lieutenant where he flew with No. 2 Squadron, Royal Flying Corps. On 27 March 1918 over Albert, France, Second Lieutenant McLeod, with his observer Lt. Arthur Hammond, in an Armstrong Whitworth F.K.8 destroyed an enemy triplane and was immediately attacked by eight more, three of which they brought down, but the petrol tank of the bomber was hit. The machine burst into flames and both pilot and observer were badly wounded. McLeod, by side slipping steeply, tried to keep the flames away from his observer, and when the machine finally crashed in No Man's Land, the young pilot, not minding his own injuries, dragged his comrade from the burning wreckage and under heavy fire carried him to comparative safety, before collapsing from exhaustion. McLeod was wounded three times in the side and Hammond was wounded six times. Hammond lost a leg but was awarded a bar for his Military Cross. McLeod was recommended for a Distinguished Service Order but received the Victoria Cross. He returned to Canada (Stonewall, Manitoba) to recuperate but died from the Spanish Influenza shortly thereafter. Thomas Mottershead & Royal Aircraft Factory FE2d. Photo commons.wikimedia.org. Thomas Mottershead VC, DCM (17 January 1892 - 12 January 1917) was an English recipient of the Victoria Cross. Mottershead, who had studied engineering, enlisted in the Royal Flying Corps on 10 August 1914 as a mechanic and was posted to the Central Flying school at Upavon and was promoted to Sergeant on 1 April 1916. In May 1916 he began pilot training and in June of that year he obtained his Flying Certificate. He was posted to No.25 Squadron at St Omer on 6 July 1916 flying the FE 2, and saw action in the Battle of the Somme. On 7 January 1917 near Ploegsteert Wood, Belgium, Sergeant Mottershead was on patrol in FE-2d with observer Lt. W E Gower when he was engaged in combat by two Albatros D.III. Lt Gower managed to hit one and put it out of the action, the second Albatros however, flown by German 'ace' Lieutenant Walter hit Mottershead's aircraft, with the petrol tank pierced and the machine was set on fire, the FE-2D was enveloped in flames which his observer was unable to subdue with a handheld fire extinguisher. Mottershead was badly burned but nevertheless managed to take his aircraft back to the Allied lines and made a successful forced landing. The undercarriage collapsed on touching the ground however, throwing the observer clear but pinning Mottershead in his cockpit. He was subsequently rescued but died of his burns five days later. Mottershead received the only V.C. ever awarded to a non-commissioned RFC officer during the First World War. William Barnard Rhodes-Moorhouse & Royal Aircraft Factory BE2. Photo commons.wikimedia.org. 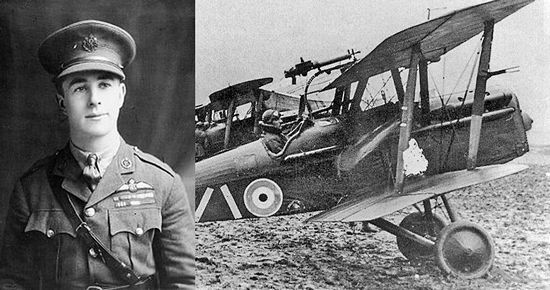 William Barnard Rhodes-Moorhouse (26 September 1887 - 27 April 1915) was the first airman to be awarded the VC. 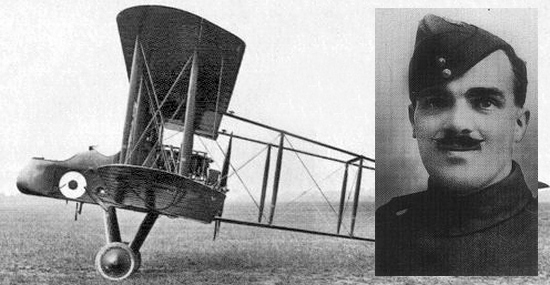 Rhodes-Moorhouse took private flying lessons and gained his pilot's certificate and later enlisted in the Royal Flying Corps and as a second lieutenant was posted to Farnborough. Seeking to serve on an operational basis, he obtained a posting to No. 2 Squadron on 20 March 1915 at Merville, flying the B.E.2. At the outbreak of war On 26 April 1915 at Kortrijk, Belgium, Rhodes-Moorhouse swept low over the railway junction that he had been ordered to attack. He released his 100 lb (45 kg) bomb and was immediately plunged into a heavy barrage of small arms fire from rifles and a machine-gun in the belfry of Kortrijk Church. He was severely wounded by a bullet in his thigh and his plane was badly hit. Returning to the Allied lines, he again ran into heavy fire from the ground and was wounded twice more. He managed to get his aircraft back and insisted on making his report before being taken to the Casualty Clearing Station. He died the next day, 27 April 1915. For this action he was awarded the VC. His son, also called William (Willie) was less than a year old when his father died. He went on to join No. 601 Squadron RAF. He was shot down and killed over Kent during the Battle of Britain in 1940, shortly after being awarded the DFC. William Leefe Robinson & Royal Aircraft Factory BE2c. Photo commons.wikimedia.org. William Leefe Robinson VC (14 July 1895 - 31 December 1918) entered the Royal Military College, Sandhurst in August 1914. In March, 1915 he went to France as an observer with the Royal Flying Corps. After having been wounded over Lille he underwent pilot training in Britain, before being attached to No. 39 Squadron, a night-flying squadron at Sutton's Farm airfield. On the night of 2/3 September 1916 over Cuffley, Hertfordshire, Lieutenant Robinson, flying a converted B.E.2c night fighter sighted a German airship, one of 16, which had left bases in Germany for a mass raid over England. Robinson made an attack at an altitude of 11,500 ft (3,500 m) approaching from below and closing to within 500 ft (150 m) raking the airship with machine-gun fire. As he was preparing for another attack, the airship burst into flames and crashed in a field behind the Plough Inn at Cuffley, killing Commander Hauptmann Wilhelm Schramm and his 15-man crew. This action was witnessed by thousands of Londoners who cheered as they saw the airship descend in flames. Robinson was the first British pilot to shoot down a German airship over Britain during the First World War. The propaganda value of this success was enormous to the British Government as it indicated that the German airship threat could be countered. When Robinson was awarded the VC by the King at Windsor Castle, huge crowds of admirers and onlookers were in attendance. Robinson was also awarded �3,500 in prize money and a silver cup donated by the people of Hornchurch. On 5 April 1917 Robinson's formation of six aircraft encountered the Albatros D.III fighters of Jasta 11 led by Manfred von Richthofen. Four were shot down. Robinson, flying Bristol F2A A3337, was shot down by Vizefeldwebel Sebastian Festner, and was wounded and captured. He died from Spanish Flue soon after his release. Ferdinand Maurice Felix West & Armstrong Withworth Photo Imperial War Museum commons.wikimedia.org. Air Commodore Ferdinand Maurice Felix West, VC, CBE, MC (19 January 1896 - 8 July 1988) was an English recipient of the Victoria Cross. When war broke out he joined the British Army, initially in the Royal Army Medical Corps, in 1914 as a private before being commissioned in May 1915 and joining the Royal Munster Fusiliers. He arrived in France in November 1915. After a flight in early 1917, West decided to transfer to the Royal Flying Corps, training as an observer at Brooklands, and sent back in France in April 1917 to No 3 Squadron, becoming a fully qualified observer in July 1917, having accumulated over 100 flying hours. After six months and 225 flying hours he was posted back to Britain to undergo pilot training at Grantham. He was then posted to No 8 Squadron in January 1918, flying Army co-operation duties. West was a 22 years old captain when on 12 August 1918 setting off at dawn, West and his observer, Lt JAG Haslam, flying an Armstrong Whitworth FK 8 spotted an enemy concentration through a hole in the mist. Avoiding severe ground fire they almost immediately came under attack from seven German fighter aircraft and West was hit in the leg and his radio transmitter was smashed. Continuing to identify his location, he remained under attack and manoeuvred his machine so skilfully that his observer was able to get several good bursts into the enemy machines, which drove them away. Only when he was sure of the enemy's position did he attempt to break off and head for his own lines. He twisted his trouser leg into a tourniquet to stem the flow of blood from his wounds. Unable to make his airfield West landed behind the Allied lines and insisted on reporting his findings despite being in excruciating agony. His left leg had five wounds, one of which had shattered his femur and cut the femoral artery, and had to be amputated. Shortly afterwards he was invalided back to Britain, where on 9 November 1918 he learned that he had been awarded the Victoria Cross. After recovering from his amputation, West was fitted with an innovatively designed Swiss artificial leg. Lionel Wilmot Brabazon Rees & Airco DH2. Photo Imperial War Museums commons.wikimedia.org. Group Captain Lionel Wilmot Brabazon Rees VC, OBE, MC, AFC, RAF (31 July 1884 - 28 September 1955) was a Welsh recipient of the Victoria Cross. He was credited with eight confirmed aerial victories, comprising one enemy aircraft captured, one destroyed, one "forced to land" and five "driven down". 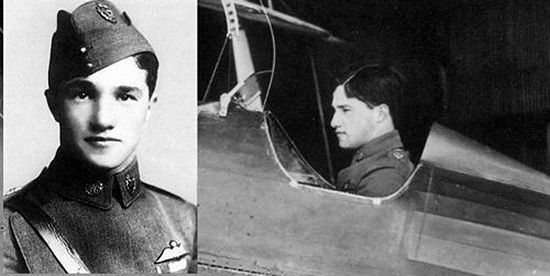 Rees and his gunner, Flight Sergeant James McKinley Hargreaves, were the only two airmen to become aces flying the earliest purpose-built British fighter airplane, the Vickers Gunbus. Rees was 31 years old and a temporary major in No. 32 Squadron when in the first hours of the Somme Offensive, Rees was on patrol, taking off in Airco DH.2. His attempt to join a formation of "British" machines brought an attack from one of the Germans. He shot up the attacker, hitting its fuselage between the two aircrew. As it dived away, Rees attacked a Roland. Long range fire from three other Germans did not discourage Rees from closing on it. Rees fired into it and it fled. Rees then single handedly went after five more Germans. A bullet in the thigh paralysed his leg, forcing him to temporarily break off his assault. As the shock of the wound wore off, he was able to pursue the German formation leader, which was leaving after dropping its bomb. He fired his Lewis machine gun empty. In frustration, he drew his pistol but dropped it into his DH.2's nacelle. Rees gave up the futile chase, and returned to base. Once landed, he calmly asked for steps so he could deplane. Once seated on the aerodrome grass, he had a tender fetched to take him to hospital. The valour of his actions earned him the Victoria Cross. World War 1 proved the value of the aircraft as a weapon of war. The fighter reigned supreme and five kills made a pilot a "Ace" and "Aces" were the heroes of the day. The aircraft was such a new concept that some were rewarded with the Victoria Cross for merely achieving a number of kills whilst others got the highest award for truly going beyond the bounds of duty. World War 2 was to change all that. Parts three and four to follow.